I’ve been busy crocheting again. After my globetrotter blanket, I wanted something a little smaller to work on in my spare moments. 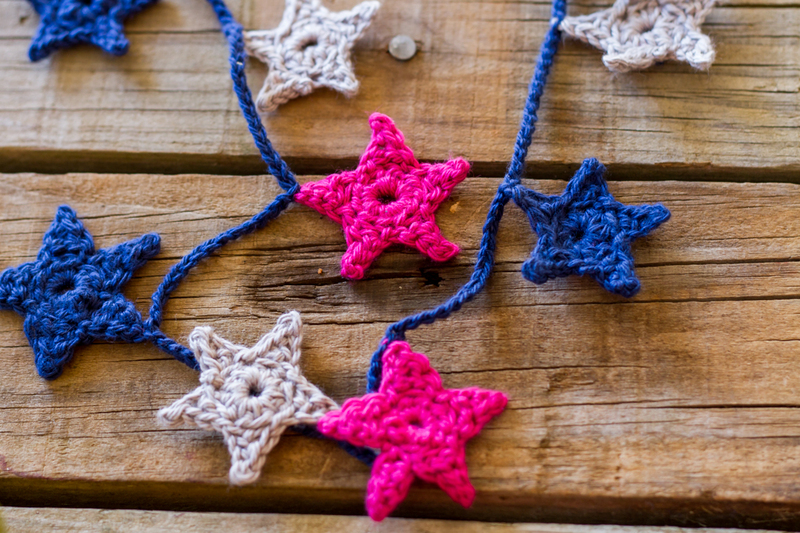 I had pinned some crochet stars on Pinterest, so thought I would have a go at making some into a star garland. For me, half the fun of crochet is fiddling around to work out how the pattern works. 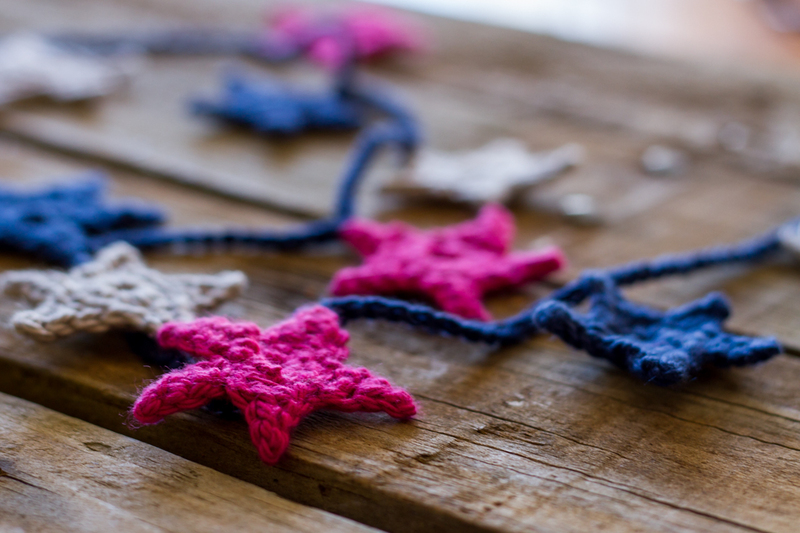 I must have made and unraveled at least 10 stars before I was happy with the final pattern. I had some gorgeous Bendigo Woolen Mills cotton yarn that I had purchased without any particular project in mine, so I pulled it out and use it for this (and I felt a little disloyal not buying Australian wool – we are sheep farmers after all!). The yarn is less “fluffy” than woolen yarn, giving the stars a smoother look and more defined stitches. To begin with I chained 5 stitches and joined them with a slip stitch to form a small ring. I then did 10 half treble stitches around the ring, joining the last stitch to the first with a slip stitch. This formed the center ring. To do the points, chain 5 stitches, then do a double crochet into the 3rd chain of the length, followed by a half treble into the 4th chain, and a treble in the 5th chain. To attach the point, skip over one stitch of the ring, and slip stitch into the second stitch of the ring (wow that sounds confusing). Repeat this four more times to create the five points before finishing the star. 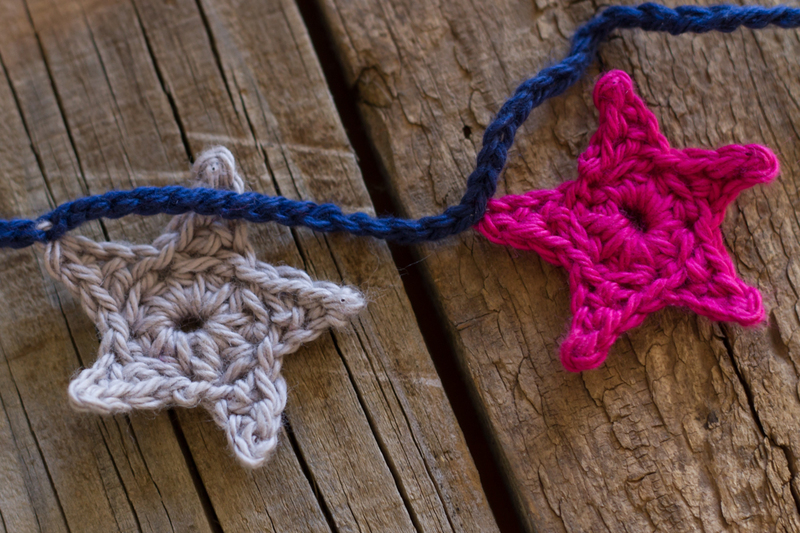 Use a needle to thread the yarn ends into the star. Once the stars were made, I blocked them to help them sit flat, and then attached them to a long chain stitch with 15 stitches between each star. I had 9 stars of each colour, for a total of 27 stars. The whole garland ended up being about 2 meters long. It would be super easy to make more stars and make the garland even longer. Here’s a link to a drawn pattern if you need one (I found the pattern on Pinterest after I had finished the garland – I really must get better at searching for patterns etc before trying to make my own so often). I made the stars using Bendigo Woolen Mills’ 8 ply in French Navy, Pomegranate, and Fawn, using a 3.25mm hook. I loved that I could knock out the stars super quickly when ever I had 5 minutes to spare, then I just finished them up all together at the end. This project could really be done in a few hours. I’m not sure exactly what I’m going to do with the garland. It would look super cute in a playroom or little girls bedroom. My girls have suggested that they might like it in their room, so I think that it may end up in there. I’m also planning on making some more in Christmas colours for our tree this year! Next crochet project is another blanket in greys and greens for Meg, inspired by my friend Emma. I’m already planning on visiting the wool shop next time in town to find the perfect shades. What project are you working on? Do you switch between large and small projects too? These are so sweet Jo!! And love the Bendigo Wool, it’s divine isn’t it!